Shares of Apple (NASDAQ:AAPL) lost 11.7% last month, according to data provided by S&P Global Market Intelligence. For perspective, the S&P 500 index fell 9.3% in value last month. The iPhone maker reported a solid quarter in September, with revenue up 20% year over year and earnings per share up 41% year over year. However, Apple issued lower-than-expected guidance for the fiscal first quarter (which ended in December), sending shares tumbling. That negative sentiment carried over to the month of December. Moreover, there's been a lot of concern about how China-U.S. trade relations might impact iPhone sales. On top of that, in early December, a Chinese court ordered Apple to halt sales of older iPhone models. China accounted for about a fifth of Apple's total revenue in fiscal 2018 (which ended in September). 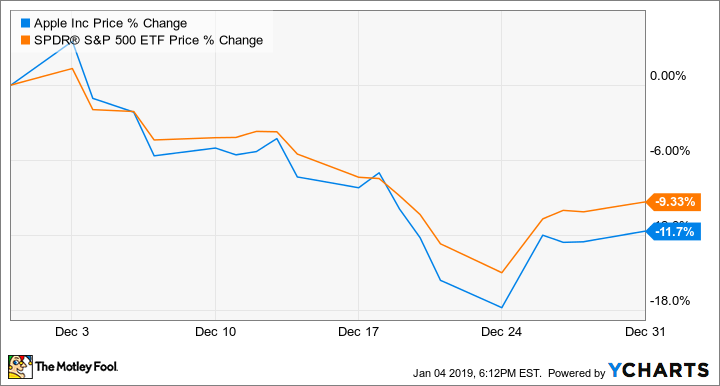 At least a few analysts have cut their price targets on Apple over the last month, which can affect the stock's performance in the short term. Matters were made worse when CEO Tim Cook issued a letter on Jan. 2, 2019, saying that revenue will be $84 billion for the fiscal first quarter, lower than the previous guidance for revenue of between $89 billion and $93 billion. Specifically, Cook cited the economic slowdown in China, in addition to supply constraints, in ramping new products for the revenue shortfall. The updated guidance has sent the shares down another 6% since the end of December. On the bright side, the sharp decline in the stock price has brought the valuation down to a cheap level. Apple is still one of the most valuable brands in the world, which could make the stock worth considering right now. Even though customers haven't upgraded their iPhones as fast as management anticipated, Cook noted that "there are more Apple devices being used than ever before, and it's a testament to the ongoing loyalty, satisfaction, and engagement of our customers." Apple's non-iPhone businesses, including services, wearables, and Mac, had a strong quarter ending in December, with revenue growing 19% year over year. In his letter, Cook provided encouraging words for investors, saying "We manage Apple for the long term, and Apple has always used periods of adversity to reexamine our approach, to take advantage of our culture of flexibility, adaptability and creativity, and to emerge better as a result... Apple innovates like no other company on earth, and we are not taking our foot off the gas."